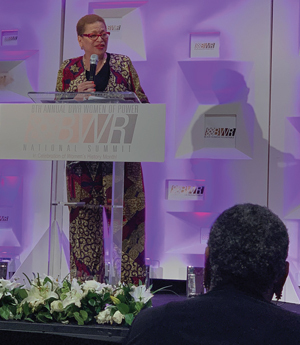 WASHINGTON—The National Coalition on Black Civic Participation’s Black Women’s Roundtable (BWR) Intergenerational Public Policy Network recently convened its 8th Annual Women of Power National Summit (BWR Summit ’19) in the nation’s capital. The gathering brought together Black women leaders and allies from across the country for five power packed days to share the organization’s public policy agenda priorities with the 116th Congress, develop organizing and empowerment strategies to lift up and improve the lives of Black women, their families and communities and more. “Each year the BWR Women of Power Summit serves as the premier forum focused on showcasing and lifting up the unique power, leadership, expertise, talents and influence of Black women from diverse backgrounds and ages” explained Melanie L. Campbell, president & CEO, NCBCP and convener of the Black Women’s Roundtable. This year’s theme, “It’s Time to Lead, Rise, and Shine,” embodied the BWR Summit’s mission to empower Black women and girls to build, organize, and strategize to leverage their collective and individual economic and political power. The summit was held March 14- 19 and featured workshops on race and gender equity, economic security and prosperity, income inequality, health, and economic issues. Felicia Davis, co-founder of the HBCU Green Fund and director of the Building Green Initiative at Clark Atlanta University led the workshop on “Higher Education: Saving our HBCUs.” She shared tips for parents with college-bound children. “When your child is looking for an HBCU, insure a good institutional fit. Consider where they’ve grown up and what they’ve done. Does it have the field they are looking for? A quiet child might not be good in a loud city school,” she explained. “Consider the finances. Don’t do anything you can’t afford. Get the money or pick a different option; debt versus return. Today loans assess the parents’ credit score. As a parent don’t send your child some place you’ve never been,” she added. The conference also included a closing session: A National Town Hall Meeting and Call to Action—Leveraging the Power of the Sister Vote & Leadership in 2020 Presidential Election, 2020 Decennial Census and 2021 Redistricting. Economist Dr. Julianne Malveaux spoke on the fragile state of family economics that was revealed by the 35-day government shutdown. It revealed that most American’s are not prepared financially. “Forty percent of all Americans, this is not Black Americans, this all Americans, could not absorb a $400 emergency. What is a $400 emergency? Your engine blows on your car. Someone throws a rock at your windshield. Your child is rushed to the emergency room and they ask you before they look at your child, for your copay,” explained Dr. Malveaux. Other critical subjects during the summit focused on Black women and Black girls in concurrent sessions and included: “Sisters Vote Roundtable: A Look Back at 2018: Black Women Lead Power Shift,” “Black Girl Power Roundtable: Emerging Leaders Share Their Stories About Owning Their #BlackGirlPower in 2018!” sessions on health and wellness, entrepreneurship, civil rights and social justice and much more. Highlights of the report include: Why Black Women Vote and What They Want, Discipline Disparities Plague Black Girls’ K-12 Education and much more. To address the many challenges Black women and girls continue to face, The National Coalition on Black Civic Participation’s Black Women’s Roundtable will implement its 2019 BWR Racial, Economic and Gender Justice Empowerment Project (BWR Justice Project ‘19) and expand its BWR state-based networks in California, Louisiana, Mississippi and other states.